Marissa Favela found the ball at her feet late in the game while fighting scorching heat for the Matadors. When her team needed it the most, Favela ripped a shot past goalkeeper Sarah Davis two minutes into overtime for the game winning goal and giving CSUN the 2-1 victory over Utah Valley (1-3). Favela was mobbed by teammates in celebration after her clutch moment sent fans home with more to cheer about. 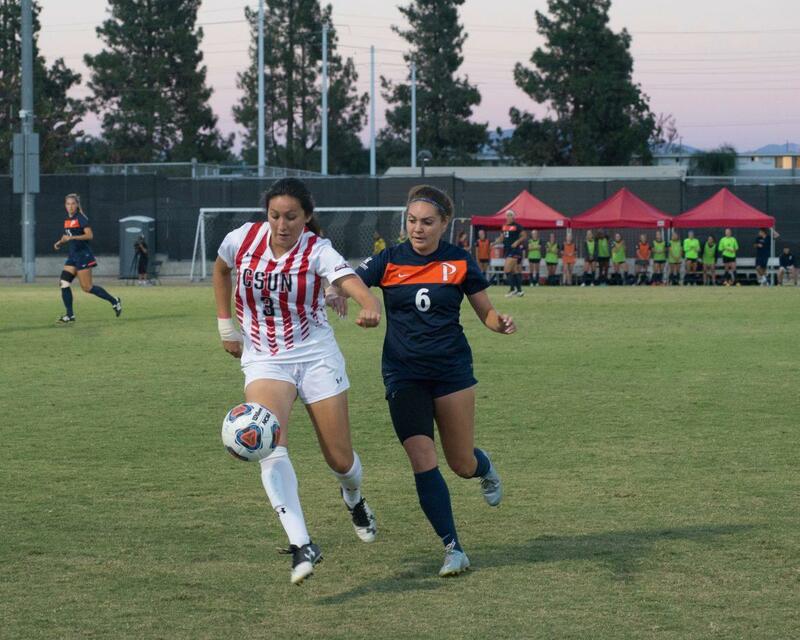 The goal gave the Matadors (2-0-2) their second consecutive win and their fourth straight result without a loss. Favela has now scored in three consecutive games and has registered four points within that span. She also assisted on a corner kick to Ariana Tran in the 19th minute. Tran threw her body into the outside post and headed it past the goal line for her first goal of the season. Things didn’t come easy for the Matadors after not allowing a shot on goal in their previous game against Houston. In the final five minutes of the first half Utah Valley had three shots on goal and hit crossbar, but CSUN came out unscathed. In the second half, Wolverines leading scorer Breanna DeWaal added her third goal of the season after putting a shot past Jovani McCaskill in the 60th to tie the match at 1-1. The game itself was moved to a 10 AM start in an attempt to avoid the high temperatures. However neither teams were hit by the heatwave and by halftime, game conditions reached to 102 degrees. During the match referees called mandatory timeouts in the middle of each half so the players could rehydrate The scorching weather in some ways gave the Matadors a slight but uncomfortable advantage according to Tran. “The biggest goal for us now is to recover our bodies, get back at it on Tuesday so then we can be ready for them on Thursday,” Favela said.